Deadlines are amazing things. They force productivity — sometimes with great results and sometimes not. I needed to finish this quilt by yesterday morning so that it could be part of the Mason Dixon Quilt Professionals’ Network (MDQPN) special exhibit “What We Do” for this year’s Road2CA. 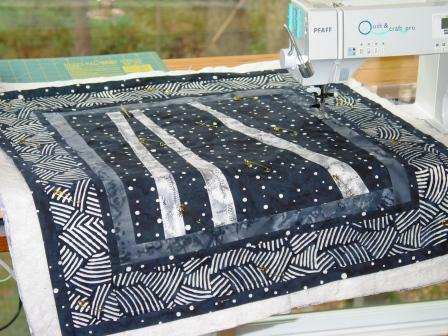 The exhibit is designed to showcase what each of the quilters in this group offers professionally. I offer a Trees workshop and pattern, and so I thought this would be a good place to show that. It’s done. I’m not exceptionally proud of this quilt, but it’s done and off my list. Such is the power of deadlines. I think if I had a chance to continue searching, I might have found a better, less distracting border fabric. I might also have found a better quilting thread color for the grey border. I might have added some surface design, augmented the snow, given more dimension to the trees. Woulda, coulda, shoulda. I’ll never know, though, because it’s done and out of my hands. Now, I’m back to the Vintage Revisited #6. (Check the archives for more on the process for this one.) 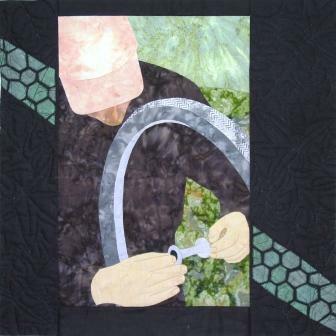 I’ve quilted leaves into the black borders and I’ve added the green vintage pieces to form a tire track. The green vintage fabric was still pretty icky, and so I stamped it with commercial and original stamps. I think it’s kind of ironic that the track interrupts the portrait the same way the vintage materials interrupt my normal process. It’s a fitting way to complete this series of six quilts. Our MDQPN meeting yesterday was held at G Street Fabrics, where I was able to find the perfect spokes for the bike wheel. I can’t wait to add them and see how it turns out. I’m eager to finish this and turn it over to Mary to add to her collection. 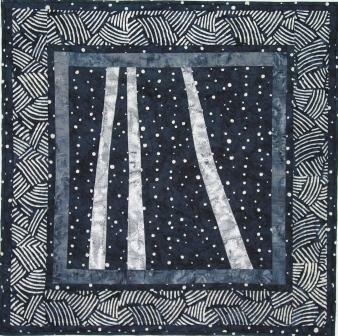 To see more Vintage Revisited quilts online or to see what shows will exhibit them, check out www.MaryWKerr.com. I’ve had quilter’s block before. I’ve had dry spells, but I’ve never had a quilt fight me. Here’s the deal. I have a deadline. Tomorrow. I’ve been thinking about this quilt and planning it in my head. Trees. Trees in winter. 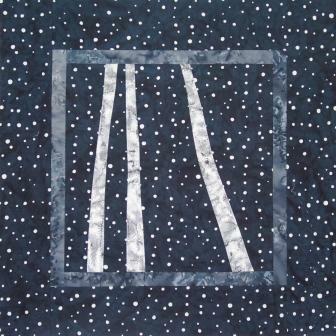 I have this amazing midnight blue batik with irregular white dots that look to me like snow at night. I pictured pale tree trunks — just a few — in the nighttime snowfall. Easy enough? Not when the quilt fights back. I took everything I thought I’d need to my quilt guild’s fall retreat this past weekend. There, in the company of supportive friends and quilters, I planned to create this 24″ x 24″ quilt based on a pattern I created. Easy. Or at least that was the plan. The center panel was easy. Light grey and white batik with a subtle pine pattern for all three trunks. Simple. Elegant, I hoped. The borders were the first hint of trouble. I needed a narrow stopper border that would define the center panel, stopping both the dark background and the light trees. That sounds way easier than it actually was. Since I was working with blue rather than my old friend black, I had to find a grey with just the right amount of blue in it. None of my greys worked. Neither did the greys my table buddies packed. When Capital Quilts (Gaithersburg, MD) showed up as our visiting quilt shop, they had just the right one! Susan Fernandez snatched it up (I was down the mountain fetching tasty coffee drinks) and presented it to me upon my return. Thanks, Susan! The second border defied me. I had several fabrics, but nothing was great and I was away from my studio where I could continue to rummage and, perhaps, create the perfect candidate. In desperation, I added more of the snow fabric. Mistake. I put it up on the design wall and tried to get to to talk to me. All I got was the silent treatment. And so, I took it down and tried to forget about it. It seemed like this quilt did not want to be made. Once I got it home, I tried again. My friend Mary Kerr put her finger on the problem. It’s too matchy-matchy. If this quilt was supposed to represent what I do as a quilter, I had failed miserably. Off came the outside border! I found what I thought was the perfect fabric at Judy Gula’s Artistic Artifacts Annex, but it didn’t make me happy once I got it home and on the wall. After much experimentation (When I should be finishing the quilting, not the piecing! ), I came up with borders I like. Now I’m looking for quilting inspiration. Nothing. Again, the quilt’s giving me the silent treatment. And so, I’ll start with what I know. I’ll do all the ditch work (stitching in the ditch) and hope that something comes to me before it’s time to freemotion. Wish me luck! Tomorrow’s coming faster than you think.